Home News 1337 Special Edition Razer Phones: What’s The Story Behind This Number? 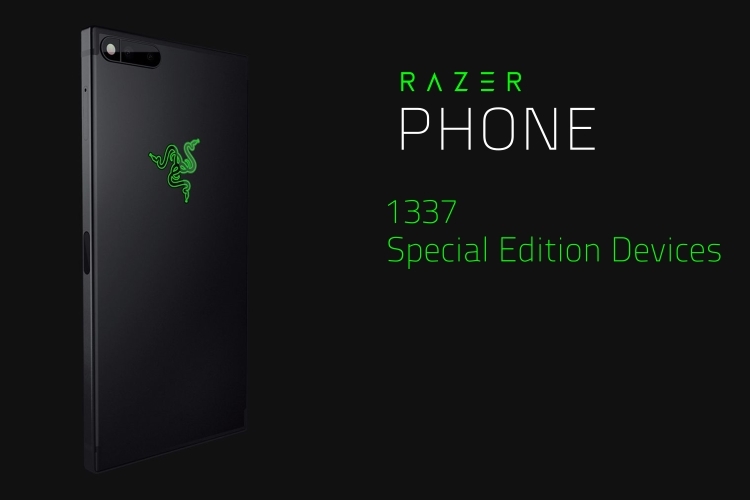 1337 Special Edition Razer Phones: What’s The Story Behind This Number? Razer recently unveiled its Razer Phone, which is easily shaping up to be one of the best smartphones of the year. The Razer Phone will be available in 2 variants, the standard black/grey, and a Special Edition featuring the Razer green snake logo. What’s interesting is the fact that Razer went on to state that they’ll only be releasing 1337 pieces of this special edition. Now, 1337 in itself sounds like a weird number, doesn’t it? Especially when companies prefer a round figure, why would Razer go with an odd number like 1337? The fact is that 1337 actually means something else in an alternative language called “Leet” used by tech-geeks. It all started way back in 1989, before the release of the World Wide Web. The online websites revolved around the BBS (bulletin board systems) sites. In that time, Leet started up as a technique for concealing online conversations from the early search engines of the time. Later on, in the days of Windows 95, a hacker group named ‘Cult of the Dead Cow’ used to take remote control of Windows 95 machines. For their purposes, they used the network port 31337, which in Leet, stands for “elite”. Years since, the concept of Leet has changed. The language is mostly preferred as a power user language. While it still lives true to its purpose of bypassing search engine queries, leetspeak (or the language Leet) is often the trademark of serious Internet gamers and people who pride themselves on being technically savvy. In the world of online gaming, the term leet is also used as an adjective to describe formidable prowess or accomplishments. Some common terms in leetspeak are – n00b, hax0r, 3ber, r0x0r, pwn3d, pr0n, d3bug, br4ve, and so on. So while 1337 might sound like a weird number at first, the fact is that it has quite a significance behind it. Over the years, 31337 has been trimmed down to just 1337, which stands for ‘elite’. Razer stands out to be the best company in terms of gaming peripherals. It has rightly so, in the gaming-tech language only, implied its dexterity in the same field. The Razer Phone is truly elite in its class and is signified by the 1337 Special Edition devices.